On Saturday, The Reef, a medical marijuana dispensary, is hosting an event for children with cancer where you can also “ooo” and “ahhh” at cool, unique, and vintage cars in honor of dream cruise season. 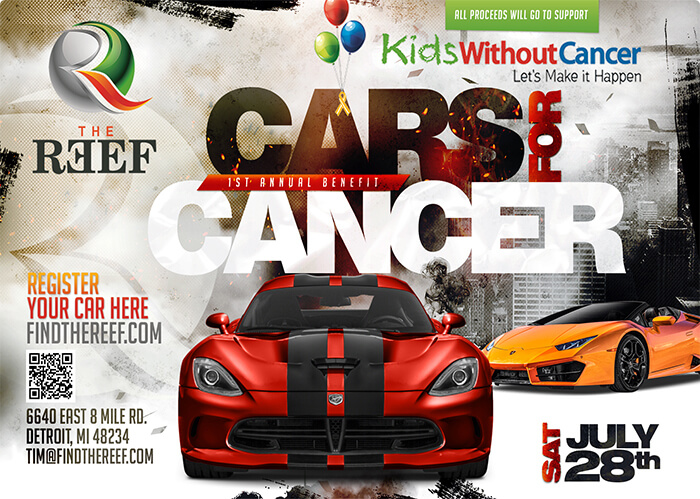 The Reef is excited and proud to host the first ever Cars for Cancer event. Their goal is to raise $100,000 for the Charity Kids Without Cancer, so tell your friends and family about this fun and meaningful event.Kids without Cancer is an organization that has been raising money to fund the pediatric cancer research based at The Children’s Hospital of Michigan, University of Michigan and Karamanos Cancer institute for the past 36 years. There will be cars to gawk over, live bands, food, face painting, bounce houses, and more, so bring your friends and family to this fun and meaningful event! As well as all of these fun activities, there will also be a car contest where you can enter your car for a grand prize and all proceeds gained at this event will all be donated to Kids Without Cancer. The Cars for Cancer event will take place at The Reef, located at 6640 east 8 Mile Rd, Detroit, Michigan on Saturday July 28 from 10am-8pm. For more information, please visit findthereef.com. Bring your friends and family and we at Grow Cannabis Marketing and The Reef all hope to see you there!